Bane is coming for Batman. 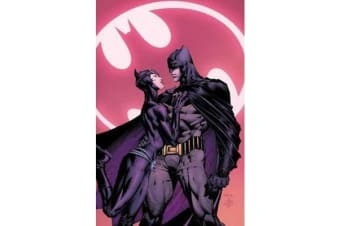 Bruce must keep those he loves safe for five days in order to save Gotham Girl once and for all. But Bane will stop at nothing, no one is safe, and by the end of this fight, the Dark Knight will never be the same. This epic hardcover collection includes the cataclysmic events of THE BUTTON, in which Batman and the Flash unite to explore the mystery behind a certain blood stained smiley button. Armed with the terrifying knowledge of a coming storm, Batman makes a proposition to one of his enemies—one that will change everything for the Dark Knight and his allies! This collection ends on a note that everyone will be talking about for years to come. Tom King continues his critically acclaimed run on BATMAN! Collects BATMAN REBIRTH #16-32 and BATMAN ANNUAL #1.